The larger Indian muntjac was brought to Woburn Park in about 1900. After a short time it was removed from the park but a small population survived in the wild until 1925. The smaller Reeves’ muntjac was introduced before 1900 and flourished, rapidly spreading into surrounding areas. There is no evidence that the Reeves’ hybridised with the Indian species while it was present. 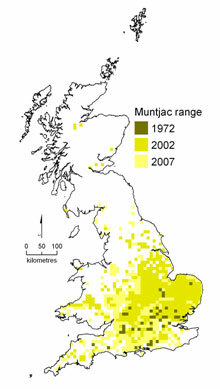 The spread of the Reeves’ muntjac throughout the mainland Britain since 1972 is shown in the distribution map. Records of small colonies outside the main areas suggest human intervention. The Muntjac is regarded as an introduced non-native species and its release into the wild is prohibited under Section 9 of the Wildlife and Countryside Act 1981. Muntjac are territorial and the social unit is a family group, with young adults being driven off before the arrival of the next fawn. Males make large scrapes and fray on low branches, mostly using their tusks, rather than their antlers. 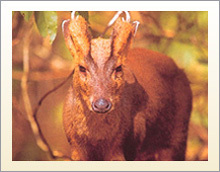 The tusks are the muntjac’s primary weapons, showing its primitive ancestry. Both sexes bark like a small dog at intruders, often continuing for many minutes. Their preferred foods are ivy, bramble, coppice shoots, flowers and seeds of many plants, also fruit, nuts, dead leaves, fungi and market garden produce. They seem primarily animals of dense woodland, although analysis of the occurrence of sightings suggest their habitat preferences are very catholic.